Aim: The objective of the study was to find pathogens currently colonizing the wounds of patients admitted to burn intensive care unit (ICU) and to evaluate drug resistance among the common organisms. Materials and Methods: A retrospective analysis of bacterial isolates from the wounds of patients admitted to burn ICU in a tertiary care center. The study was conducted from November 2015 to April 2017. A total of 126 isolates were analyzed. Results: Pseudomonas and Klebsiella were the most common organisms followed by Acinetobacter. The antibiotic-sensitive patterns of these three common bacteria were analyzed. Statistical analyses were performed using one-way analysis of variance and post-hoc Tukey honest significant difference test. The study helped to infer that the multidrug resistance (MDR) of Acinetobacter is greater than that of Pseudomonas or Klebsiella and is significant (P < 0.05). Conclusion: The MDR seen in the isolates is a matter of concern. A study of bacterial isolates from the patients with burns and the sensitivity pattern of these isolates would assist to create or modify institutional drug policy. Burns is one of the frequent and mortifying forms of injury. Patients with thermal injury need immediate specialized care to reduce morbidity and mortality. This skilled attention is given in the burn intensive care unit (ICU) in our hospital. After an initial period of shock resuscitation, infections are the cause of significant problems in burn injury. Despite the fact that burn wound surfaces are sterile immediately following thermal injury, these wounds become colonized with microorganisms in a few days. The extent of the burn injury along with the type and amount of microbes colonizing the burn wound appear to impact the future risk of developing an invasive wound infection. The pattern of infection of these infective organisms varies from place to place. Moreover, the drug resistance of these microorganisms increases each year. The purpose of the survey was to find the currently prevalent pathogens in the burn ICU in our tertiary care center and to evaluate the multidrug resistance (MDR) of the commonly found organisms using statistics. Our burn ICU has 125 sq. ft. bed space area per patient. Besides, there is optimum additional space for storage, nursing station, and relatives. The bedside service equipment conforms to common standards and is always available. Hand washing is routinely performed before and after examining patients. Donning cap, mask, and shoes before entering the ICU is mandatory for all. The cleaning of equipment, beds, trolleys, door, and handles were done periodically. Plastic surgeons, intensivists, trained staff nurses, nutritionists, and physiotherapists manage the patients in intensive care. At all time, the patients are allotted nursing care staff in the ratio of 1:1. The protocol followed in the ICU was to take a wound swab from the appropriate burn wound of the patient when the clinical signs of local infection emerged. Antibiotic therapy followed during the study period included an initial systemic prophylactic antimicrobial therapy with cefotaxime and the use of topical antimicrobials such as silver nitrate or povidone-iodine before surgical intervention. This study was a retrospective analysis of bacterial isolates from patients admitted to burn ICU. Wound swabs from the burn wounds were collected between November 2015 and April 2017 and were analyzed. Patients who had already received treatment in other hospitals and were referred to our center were excluded from participation. Out of 164 patients included in the study, samples collected from 38 patients did not show bacterial pathogens. Hence, 126 samples were included in the study. Repeat isolation from the same patient was not included in the analysis. The day of wound swab collection varied from 4th post-burn day to 13th post-burn day with a mean of 8.2. The sample was analyzed for a spectrum of organisms developing on the burn wound swab and their antibiotic resistance. The study was performed to examine the difference in resistance of these microorganisms to antibiotics by using statistics. The resistance of three common bacterial isolates was statistically studied. The null hypothesis states that there is no significant difference in drug resistance pattern among these three common strains. Statistical analysis used was one-way analysis of variance (ANOVA) (P < 0.05) derived using post-hoc Tukey honest significant difference (HSD) test. Gram-negative organisms predominated our samples with 82.5% (104/126), and the percentage of gram-positive microorganisms was 17.5% (22/126). Gram-positive organisms grown in the study were Enterococcus, coagulase-negative Staphylococcus aureus, and Staphylococcus aureus. Methicillin-resistant Staphylococcus aureus developed in 5% of the patients (N = 6/126). Linezolid and vancomycin remained the most sensitive drugs in infection caused by gram-positive bacteria. The gram-positive organisms were found to be more resistant to ampicillin, cefotaxime, ciprofloxacin, and gentamycin [Table 1]. 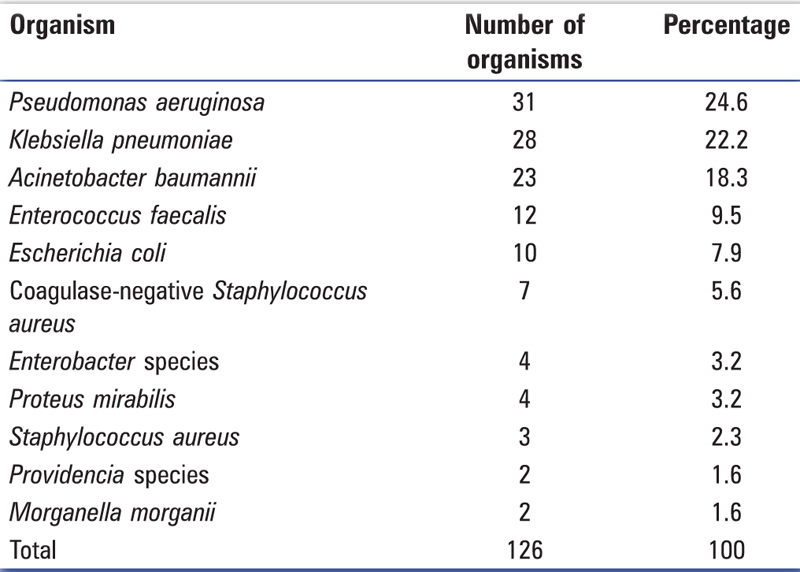 Among the gram-negative microorganisms, Pseudomonas aeruginosa was the most prevalent pathogen (31; 24.6%), followed by Klebsiella pneumoniae (28; 22.2%) and Acinetobacter baumannii (23; 18.3%), as shown in [Table 2]. Pseudomonas, Klebsiella, and Acinetobacter constituted more than 78% (N = 82/104) of the gram-negative bacilli. The drug resistance for these three common organisms varied [Table 3]. 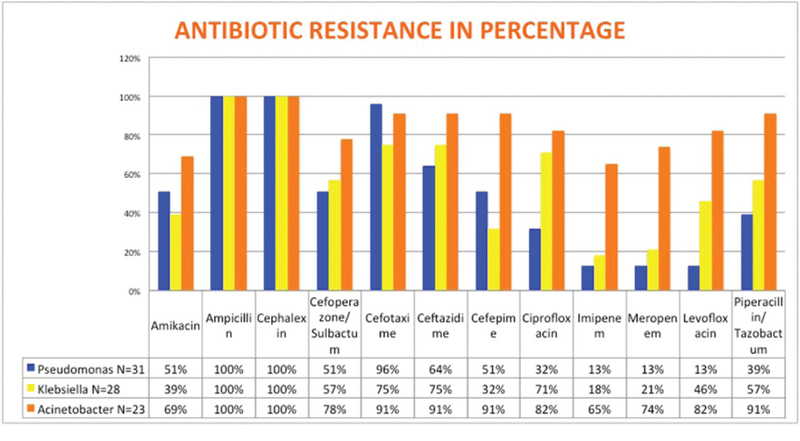 The antibiotic resistance of these three organisms was converted to a percentage [Figure 1], and then antibiotic resistance was analyzed using statistics. 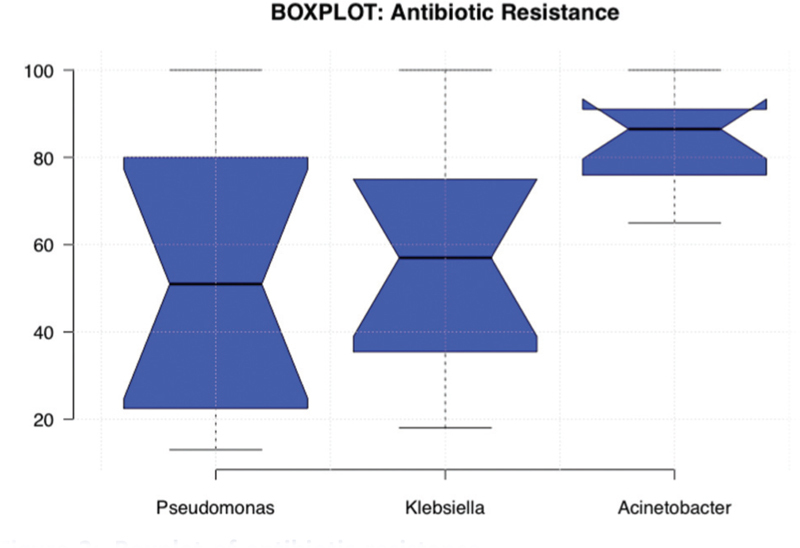 The boxplot regarding the antibiotic resistance of the aforementioned three organisms is represented in [Figure 2]. The plot reveals greater antibiotic resistance for Acinetobacter when compared with Pseudomonas or Klebsiella. One-way ANOVA with P value 0.05 was used in statistical analysis. The calculated P value of 0.0085 proves that there is a variation of antibiotic resistance among the organisms, thereby disproving null hypothesis. However, the above test does not reveal which microorganism is more resistant. Hence, post-hoc Tukey HSD test was used to understand resistance pattern. 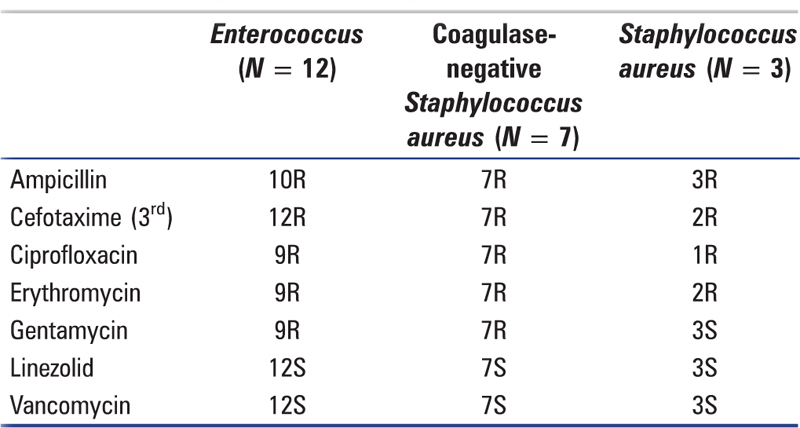 Tukey HSD test shows the P value of <0.05 (P value 0.0104) while comparing Pseudomonas and Acinetobacter. A similar result of P < 0.05 (P value 0.0383) was found between Klebsiella and Acinetobacter [Table 4]. The test also showed there was no significant difference (P value 0.8515) in MDR between Pseudomonas and Klebsiella (P > 0.05). Thus proving, Acinetobacter was a more multidrug-resistant organism compared to the other two. Escherichia More Details coli was highly resistant to ampicillin, cephalexin, cefotaxime, ceftazidime, and ciprofloxacin; it was highly sensitive to amikacin, cefoperazone/sulbactam, and piperacillin/tazobactam. Other gram-negative microorganisms found in this study were Enterobacter, Proteus mirabilis, Providencia, and Morganella morganii. All the bacteria were resistant to ampicillin and cephalexin. Fortunately, all the gram-negatives were sensitive to polymyxin and colistin in our study. Gram-negative pathogens are more common than gram-positive pathogens in our study. In our study, no isolate of hemolytic streptococci was seen, which is a pleasant coincidence as Streptococcus pyogenes is known to cause skin graft loss. It is surprising to find all pathogens to be resistant to ampicillin and cephalexin, a first-generation Cephalosporins. Cefotaxime, one of the commonly used antibiotic in surgical prophylaxis, does not act on 90% of the Pseudomonas and Acinetobacter species. After going through the data in this study, our institute stopped using cefotaxime as an initial drug. Currently, we use silver nitrate or betadine dressing only before any sign of infection. Though Acinetobacter is the third common pathogen in burns ICU, it is the most multidrug-resistant pathogen according to the results of this study. Acinetobacter is a gram-negative coccobacillus belonging to the family Neisseria More Detailsceae. It is a nosocomial pathogen and can quickly contaminate the hospital environment. Acinetobacter species are widely distributed and are recoverable from wet and dry surfaces. It is also present in water, fruits, vegetables, healthy skin, and other body sites. The organism is readily retrievable from dry environmental niches. In healthcare infections and outbreaks, it can remain viable in dry conditions for a few weeks to a month or more. The most critical feature of Acinetobacter is their ability to develop MDR. Outbreaks of MDR Acinetobacter are challenging to control, because the patient may become colonized or infected, and environmental contamination can persist. In past decades, Acinetobacter infection occurred sporadically in the hospitalized patient. These infections have occurred most often in critically ill patients receiving invasive medical interventions such as central lines, arterial lines, and mechanical ventilation. In more recent years, Acinetobacter is increasingly recognized as a significant healthcare-associated, opportunistic and multidrug-resistant pathogen. Currently, carbapenem resistance is one of the leading challenges in managing Acinetobacter healthcare-associated infections. In addition, there are recent reports of outbreaks with pandrug-resistant Acinetobacter baumannii (additional resistance to polymyxin and colistin). Fortunately, in our patients with burns, there were no pandrug-resistant Acinetobacter. In India, as in our study, many of the centers still report Pseudomonas as the predominant organism in burn wound.,, In the study by Mundhada et al., Klebsiella pneumoniae predominated followed by Pseudomonas. The incidence of Pseudomonas that were resistant to ceftazidime (64%) and amikacin (51%) is comparable to the study of Singh et al., but resistance to cefotaxime (96%) was more comparatively. The reason could be due to the frequent use of cefotaxime in our institute. Klebsiella is the second most common pathogen in our study. It is in contrast to other studies, in which Staphylococcus was the second most common pathogen. A recent study by Mohapatra et al. showed Acinetobacter as the second most common pathogen after Pseudomonas. The quinolones (ciprofloxacin and levofloxacin) have similar mechanism of action; however, in our study, they show variation in susceptibility to Pseudomonas and Klebsiella but not Acinetobacter. The possible reason might be the greater use of ciprofloxacin than levofloxacin in our institute, leading to the development of more resistance to ciprofloxacin. Further research is needed to find the cause for the difference in susceptibility of Pseudomonas and Klebsiella but not Acinetobacter. The study analyses colonization of bacterial organisms only, not its invasiveness or mortality due to infection. Bias to the inherent nature of a retrospective study. The number of samples in this study is only 126. Large sample numbers from a high-volume center might give more information. Culture growth suppression due to ongoing antimicrobial therapy. Evaluation of only clinically infected wounds with a swab. A study of the bacterial isolates from the patients with burns and the sensitivity pattern of these isolated would assist to create or modify institutional drug policy. The results of our study show that Pseudomonas, Klebsiella, and Acinetobacter are the leading causes of burn wound infection in our patients. 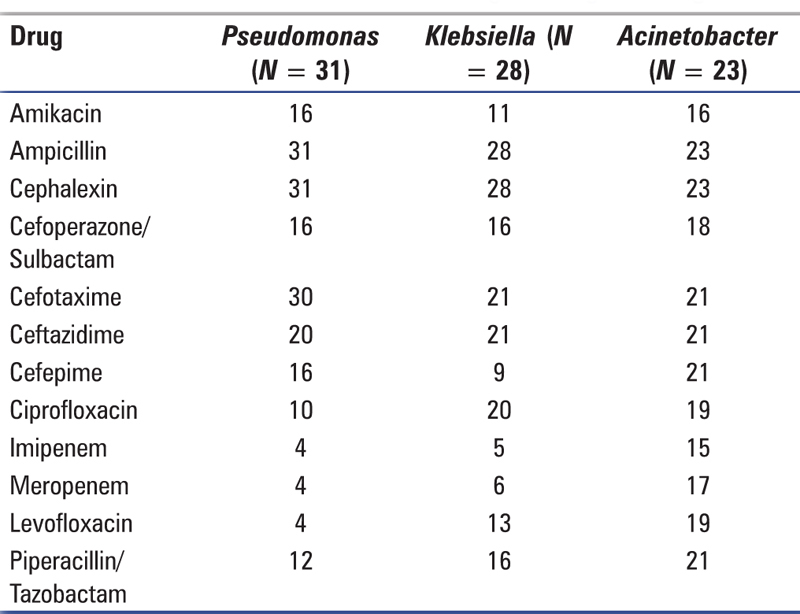 Pseudomonas and Klebsiella are more common than Acinetobacter. However, Acinetobacter is more drug resistant. The study of drug resistance in other burn centers might help to form antibiotic drug policy for burns. Manson WL, Pernot PC, Fidler V, Sauer EW, Klasen HJ. Colonization of burns and the duration of hospital stay of severely burnt patients. J Hosp Infect 1992;22:55-63. Tiwari VK. Burn wound: How it differs from other wounds? Indian J Plast Surg 2012;45:364-73. Ventola CL. The antibiotic resistance crisis: Part 1: Causes and threats. Pharm Ther 2015;40:277-83. Ananthakrishnan AN, Kanungo R, Kumar K, Badrinath S. Detection of extended spectrum beta-lactamase producers among surgical wound infections and burns patients in JIPMER. Indian J Med Microbiol 2002;18:160-5. Wendt C, Dietze B, Dietz E, Rüde H. Survival of Acinetobacter baumannii on dry surfaces. J Clin Microbiol 1997;35:1394-7. National Nosocomial Infections Surveillance (NNIS) System Report. Data summary fromJanuary 1992 through June 2004, issued October 2004. Am J Infect Control 2004;32:470-85. Fournier PE, Richet H. The epidemiology and monitoring of Acinetobacter baumannii in health care facilities. Clin Infect Dis 2006;42:692-9. Beck-Sagué CM, Jarvis WR, Brook JH, Culver DH, Potts A, Gay E et al. Epidemic bacteremia due to Acinetobacter baumannii in five intensive care units. Am J Epidemiol 1990;132:723-33. Peleg AY, Hooper DC. Hospital-acquired infections due to gram-negative bacteria. New Engl J Med 2010;362:1804-13. Peleg AY, Seifert H, Paterson DL. Acinetobacter baumannii: The emergence of a successful pathogen.Clin Microbiol Rev 2008;21:538-82. Van Looveren M, Goossens H. ARPAC Steering Group. Antimicrobial resistance of Acinetobacter sp. in Europe. Clin Microbiol Infect 2004;10:684-704. Mehta M, Dutta P, Gupta V. Bacterial isolate from burn wound infections and their antibiograms: An eight-year study. Indian J Plast Surg 2007;40:25-8. Revathi G, Puri J, Jain BK. Bacteriology of burns. Burns 1998;24:347-9. Ramakrishnan MK, Sankar J, Venkatraman J, Ramesh J. Infections in burn patients − Experience in a tertiary care hospital. Burns 2006;32:594-6. Mundhada SG, Waghmare PH, Rathod PG, Ingole KV. Bacterial and fungal profile of burn wound infections in tertiary care center. Indian J Burns 2015;23:71-5. Singh NP, Goyal R, Manchanda V, Das S, Kaur I, Talwar V. Changing trends in bacteriology of burns in the burns unit, Delhi, India. Burns 2003;29:129-32. Chamania S, Hemvani N, Joshi S. Burn wound infection: Current problem and unmet needs. Indian J Burns 2012;20:18-22. Mohapatra S, Deb M, Agrawal K, Chopra S, Gaind R. Bacteriological profile of patients and environmental samples in burn intensive care unit: A pilot study from a tertiary care hospital. Indian J Burns 2014;22:62-6. Segatore B, Setacci D, Perilli M, Franceschini N, Marchetti F, Amicosante G. Bactericidal activity of levofloxacin and ciprofloxacin on clinical isolates of different phenotypes of Pseudomonas aeruginosa. Int J Antimicrob Agents 2000;13:223-6. Church D, Elsayed S, Reid O, Winston B, Lindsay R. Burn wound infections. Clin Microbiol Rev 2006;19:403-34. Gupta M, Gupta OK, Yadu Vanshi RK, Upadhyaya J. Burn epidemiology: The Pink City scene. Burns 1993;19:47-51. Chetchotisakd P, Phelps CL, Hartstein AI. Assessment of bacterial cross-transmission as a cause of infections in patients in intensive care units. Clin Infect Dis 1994;18:929-37. Shelby J, Merrell SW. In vivo monitoring of post-burn immune response. J Trauma 1987;27:213-6. Agnihotri N, Gupta V, Joshi RM. Aerobic bacterial isolates from burn wound infections and their antibiograms − A five-year study. Burns 2004;30:241-3. Hart DW, Wolf SE, Chinkes DL, Beauford RB, Mlcak RP, Heggers JP et al. Effects of early excision and aggressive enteral feeding on hypermetabolism, catabolism, and sepsis after severe burn. J Trauma 2003;54:755-61. Perween N, Krishanprakash S, Bharara T. Prevalence of multidrug-resistant and extensively drug-resistant Proteus, Providencia, and Morganella species in burn wound infection. Int J Sci Stud 2016;3:154-6. Chauhan JR, Khare S, Lal P, Kunhikatta V, Thunga G, Nair S et al. An appraisal of antibiotic sensitivity pattern and drug utilization in burn patients. Indian J Burns 2016;24:69-73. Khan TS, Bijli AH, Wani AH. Microbiological and quantitative analysis of burn wounds in the burn unit at a tertiary care hospital in Kashmir. Indian J Burns 2016;24:62-8.